If you don’t follow us on social media yet (you can sign up to talk with us on Facebook, Twitter, and LinkedIn) then you’ve missed a chance to win a free KIBO. Our lucky winner will be receiving our robotic kit which teaches children 4-7 years-old to program and understand logic through open-ended play. 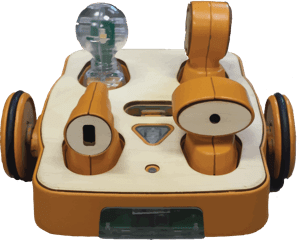 KIBO’s wooden blocks and screen-free technology allow children – and parents and teachers – to effortlessly interact with KIBO and simply get coding. Competitions are fun, and we love to share KIBO with others, but reaching out and meeting new contacts is key to our mission at KinderLab Robotics. We believe passionately that children should learn to program through open-ended, creative, and developmentally-appropriate play. Every person we come into contact with via this blog, our Facebook page, on Twitter, at events, in schools, through our newsletter, is an opportunity for us to share our mission and to discuss the role of technology, programming and robotics in child development and learning. We’ve had some great conversations with individuals and teachers who are exploring different options to help younger children learn to code, which includes several engaging conversations with teachers that are rolling KIBO out – literally and figuratively – in their classrooms. We share our views, findings, insights and supporting research in our monthly newsletter. If you’d like to receive this, please sign up now in time to receive the next edition. Meanwhile, head on over to the KinderLab Robotics Facebook, Twitter, and LinkedIn pages and never miss a giveaway again!